Countless students will walk out of class Wednesday to challenge America’s gun policies and honor those lost last month at Marjory Stoneman Douglas High School in Parkland, Florida. The walkouts will be at 10 a.m. in each American time zone and are expected to last 17 minutes, one for each of the Parkland dead. The walkout is one of several nationwide student-centered events planned over the next month on the issue of gun violence. A group of students from Stoneman Douglas High School is also organizing a march on Washington and hundreds of other cities March 24 called March for Our Lives. 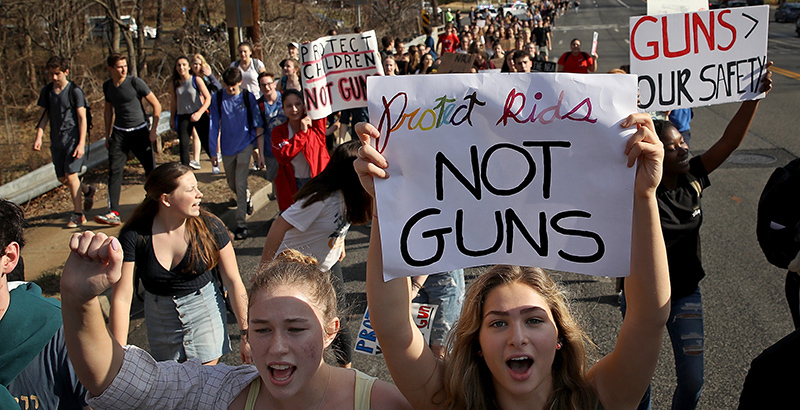 A second student-led national school walkout is planned for April 20, the 19th anniversary of the Columbine school shooting. The youth affiliate of the Women’s March organization, known as Women’s March Youth Empower, is facilitating the Wednesday march and has provided resources for student organizers. The organization has stated online that the purpose of the walkout is to demand legislative action on gun violence, and it has included a list of demands for Congress. Who is walking out with us? Several colleges and universities have released statements to let students know that any suspensions or other disciplinary action resulting from peaceful protests will not affect admissions decisions. Students who participate in New York City will have the opportunity to register to vote if they will be 18 by the end of the year, the New York Daily News reported. The Hartford School District in Connecticut will allow students to walk out in protests authorized by the school principal without facing disciplinary consequences, and it will also provide “alternate forums for social and political expression in addition to the walkout,” according to its website. Students at one school in Vermont walked out Tuesday because they do not have class Wednesday.